What’s your problem? she wants to know. Praying Mantises are usually difficult to spot because they look like a stick among other sticks on a shrub or in a tree. A burgundy chrysanthemum is definitely not good cover. It’s actually from 2008, before I began photo-blogging, but it’s one of my favorites. Usually, finding a praying mantis is a surprise as they are typically so well camouflaged while waiting for a hapless insect to land nearby, but deep rose-colored chrysanthemums are hardly a foil for a long, slender pale green insect! They aren’t fearful of humans so I could get close and take quite a few photos. I was watching its tongue flick in and out as it tasted/smelled the air, and I have a few photos of it cleaning its front legs as well. Spending time with a living creature so different from one’s self is always an interesting experience. Here are a few other photos of these little sticks. I know there’s an insect somewhere in this chrysanthemum. This entry was posted on October 29, 2014 by Bernadette. 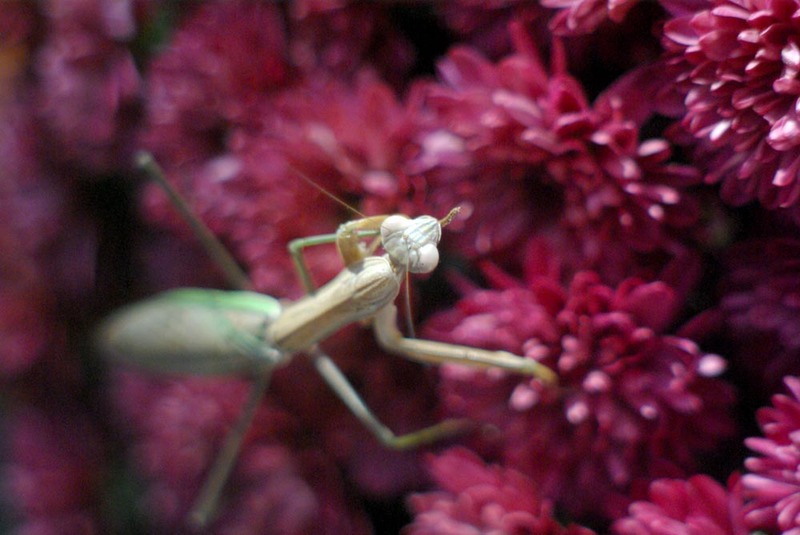 It was filed under autumn, praying mantis and was tagged with autumn, insects, outdoors, photography, praying mantis.